By Harry from Milwaukee, WI. 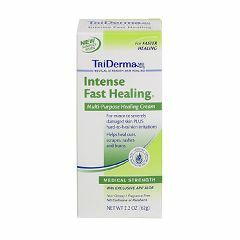 TriDerma Intense Fast Healing Cream is a specialized formula skin cream soothes, protects and promotes fast healing for hard to heal skin problems. Recommended for symptomatic relief of skin irritations, pressure sores, diabetic ulcers, burns including radiation burns, eczema, psoriasis and other skin conditions from minor to severe. Contains the powerful AP4 Genuine Virgin Aloe, vitamins A,B,D and E, oat protein, zinc pca, collagen and other advanced healing, moisturizing ingredients. Fragrance-free, cortisone-free and non-greasy. Promotes Healing. Easy To Use. I have spent a lot of money on Dermatologists and prescriptions on leg ulcers and sores. This works just as well as the expensive meds that my insurance won't pay for. Easy To Use. Promotes Healing. Effective. This may be a little premature as I've only used it once so far but I had a little irritation on my forhead and after applying this at bedtime, when I woke up the next day the irriation and reddness was gone. Softens Skin. Lightweight. Soothes Skin. Promotes Healing. Easy To Use. Safe. Effective. Non-Greasy. Moisturizes. Light. Promotes Healing. Soothes Skin. Effective. Irritated Skin. Keep In The Medicine Cabinet. Sensitive Skin. Bought this for my 85+ Dad. He had two bedsore type sores. From the first day or two that he used it, it seems to heal quickly, and he's happy. Asked on Oct 18, 2011 9:34:13 AM by jerry from fl. I'm using Curaderm to get rid of skin cancers. It is leaving my face very red. Was told over time it will fade. Well this get rid of the redness quicker. Asked on May 14, 2011 10:53:35 PM by sweetpie from s.c.